Dutch architects UNStudio have designed a concrete observation tower to cantilever into the sky above a nature reserve in the Netherlands. The 25 metre-high tower will be primarily constructed from a high-performance concrete that the studio has been researching alongside engineers ABT, developer BAM Utiliteitsbouw and concrete manufacturer Haitsma Beton. This dense concrete strengthened by steel fibres will enable the impressive cantilever, while embedded steel members will provide additional stability. Visitors will climb 134 steps to reach the highest of the tower’s three viewing platforms, which will be positioned five metres above the surrounding forest canopy. A steel mesh parapet will create a balustrade for the staircase and platforms. We've featured a few observation decks and lookout towers on Dezeen - see more here, including a tower with shipping containers on top. Other projects by UNStudio on Dezeen include a pavilion in New York's Battery Park and an installation in an abandoned fort - see all the projects here. 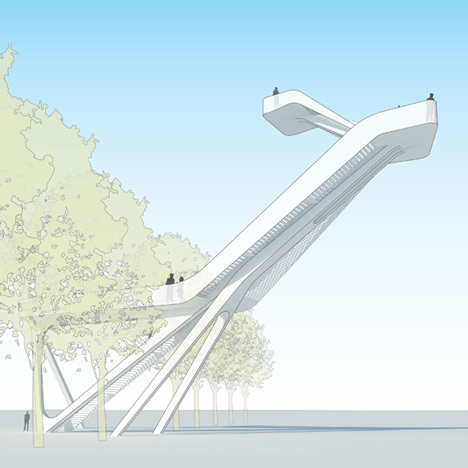 The design for the observation tower is the result of a case study which aimed to apply the characteristics of Ultra High Performance Concrete in a functional, operative design. The case study team consisted of designers, engineers and builders who together sought a solution through which architecture and construction could reinforce one another. According to Ben van Berkel, “The observation tower afforded our Inventive Materials Research Platform the opportunity to investigate the properties of Ultra High Performance Concrete and to truly test out the full potential of this new material in a real structure.” Ultra High performance Concrete differs from normal concrete as it has a very high density, contains steel fibres and has an extremely fine grain structure. These properties facilitate the application of large compressive stresses in structures of narrow dimensions. UNStudio’s Inventive Materials Platform is one of four in-house research platforms and aims to investigate custom-made material applications and to facilitate inspired and imaginative collaborations with other experts and with manufacturers in the construction industry. The 25 metre high observation tower will be realised on the forested boundary of ‘De Onlanden’ nature reserve on the outskirts of Groningen. Once built, the tower will extend 5 metres above the trees and will offer views over the 3,000 hectares of natural landscape which form the largest water storage area in the Netherlands. By means of changes in direction in the structure of the observation tower, visitors can experience views of the surrounding natural landscape from different perspectives, whereby the height of each viewing platform offers a different experience of the vistas over the surrounding landscape. From the highest viewing platform views are afforded of the Groningen skyline, which includes the Education Executive Agency & Tax office building which was also designed by UNStudio. The fine lines and the form of the tower bring to mind the silhouette of a deer. UNStudio’s design has therefore been given the (provisional) name ‘Het Hoge Hert’ (The Tall Stag). The observation Tower is a hybrid construction, consisting of a combination of steel and Ultra High Performance Concrete. Steel is employed where the tensile stresses are foremost, whereas Ultra High Performance Concrete manifests excellent performance properties where the compressive stresses are highest. The parapet around the stairs and platforms is constructed from stainless steel mesh, enabling the combination of both maximum transparency and necessary safety levels.